Pharmacological therapy for acute coronary syndrome (ACS) aims to maximise heart function by minimising areas of ischaemia and atherosclerotic progression. Medicines may also be used to facilitate other interventions, e.g., antiplatelet treatment to facilitate coronary stenting. However, medicines are not a substitute for evidence-based lifestyle interventions. Acute coronary syndrome (ACS) refers to unstable angina, non-ST elevated myocardial infarction (NSTEMI) and ST elevated myocardial infarction (STEMI). ACS is typically caused by occlusion of coronary vessels following atherosclerotic plaque disruption with subsequent thrombus formation. For more information see pathophysiology of ACS. For further guidance refer to the ACS Treatment Algorithm. Antithrombotic medications either prevent or break down a thrombus. Preventing thrombus formation with antiplatelet agents and anticoagulants is preferable to using thrombolytics to dissolve an existing thrombus that has already damaged the myocardium. Additionally, the risk of major bleeding is much greater for thrombolytics than antiplatelets or anticoagulants. Acute myocardial infarction (i.e., STEMI), where 'time is muscle', requires an aggressive approach using multiple antithrombotics. Antiplatelet medications block platelet aggregation in fast-flowing arteries, such as the coronary arteries, where thrombosis is primarily initiated by platelet activation. Aspirin works at a different site on platelets to the thienopyridines (clopidogrel and prasugrel) and ticagrelor, and thus a synergistic antiplatelet effect is provided when used together. All these treatments are orally administered. Combination therapy is used when thrombotic risk is high, such as after stent implantation, but carries a higher risk of bleeding. Intravenous (IV) glycoprotein IIb/IIIa receptor antagonists (abciximab, tirofiban) are antiplatelet agents that block the final stage in platelet aggregation. Anticoagulant medications are preferable in low-flow vessels to prevent clot formation such as in atrial fibrillation (AF) and deep vein thrombus (DVT). Thrombus prevention in ACS patients with AF, particularly those with stenting, is especially challenging in terms of aiming to balance efficacy and safety when using combined antithrombotics. Patients with a STEMI or a high-risk NSTEMI are given a fast-acting anticoagulant (IV or subcutaneous (sc) heparin or a sc low molecular weight heparin such as enoxaparin, dalteparin and nadroparin) to prevent thrombin production. This in turn inhibits fibrin generation and subsequent thrombus extension. Thrombolytics lyse or break down the thrombus. In patients with STEMI, a thrombolytic may also be added (commonly IV tenecteplase) if the patient meets certain criteria. Beta-blockers act on beta-adrenoceptors to antagonise the effects of sympathetic nerve stimulation caused by circulating catecholamines such as adrenaline and noradrenaline. This inhibition reduces the heart rate and the force of heart contraction, subsequently reducing cardiac workload, cardiac output and blood pressure (BP). Beta-blockers also reduce renin production. Beta-blockers should be started in all patients following STEMI unless absolutely contraindicated. The clinical situation should drive the timing of this treatment. Patients at higher risk of cardiogenic shock, or those with inferior STEMIs, may have beta-blockers delayed for 1-2 days post-STEMI, whereas patients with a rapid ventricular rate and an anterior myocardial infarction (MI) should begin beta-blocker treatment start as soon as possible. The role of IV beta-blockers in the immediate management of STEMI is controversial; compared with oral beta-blockers, early IV metoprolol in STEMI patients shows significantly reduced rates of reinfarction, ventricular fibrillation (VF) and decreased infarct size, but increased cardiogenic shock. IV beta-blockers are not recommended in the majority of patients with acute STEMI but could be considered in those with significant ventricular arrhythmias or severe BP elevations. Although limited evidence is available, Australian and international guidelines, however, also recommend routine use of beta-blockers for NSTEMI patients based on observational data and extrapolation from STEMI trials. Beta-blockers are also first-line agents for stable angina since they reduce systemic arterial pressure, heart rate and myocardial contractility, resulting in reduced myocardial oxygen demand and symptoms. Beta-blockers should generally be avoided in patients with decompensated HF (e.g., acute pulmonary oedema), heart block or significant bradycardia (heart rate <50 beats per minute (bpm)). For further beta-blocker treatment considerations see Cautions and monitoring. Asthma is no longer considered an absolute contraindication for cardioselective beta-blockers such as atenolol, bisoprolol and metoprolol. 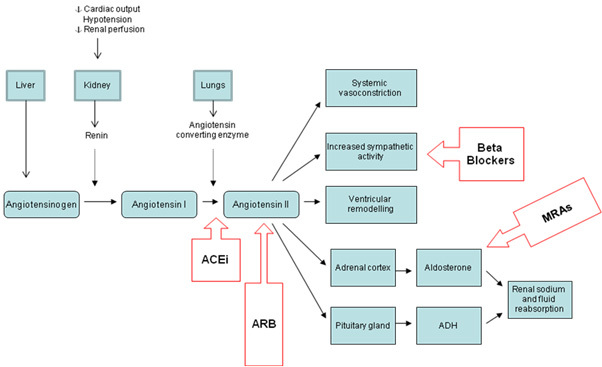 Angiotensin-converting enzyme (ACE) inhibitors and angiotensin receptor blockers (ARBs) act on the renin-angiotensin-aldosterone system (see figure below). ACE inhibitors prevent the endogenous production of angiotensin II, whereas ARBs antagonise the effects of angiotensin II. After a STEMI, where there is reduced left ventricular ejection fraction (LVEF), these medicines work to inhibit pathological left ventricular remodelling. ACE inhibitors and ARBS also cause peripheral vasodilation, thereby reducing BP. Oral statins (e.g.,atorvastatin, fluvastatin, pravastatin, simvastatin) reduce blood levels of low-density lipoprotein cholesterol (LDL-C), which is a major contributor to atherosclerotic plaque development. They also have other important pleiotropic effects such as plaque stabilisation, antioxidant, anti-inflammatory and antiplatelet effects. These multiple actions mean that statins are used even in ACS patients with normal LDL-C levels and during the acute management phase of ACS. Statins reduce mortality in patients with NSTEMI and STEMI, and should be routinely prescribed for these patients. They are lifelong medications for patients at high risk of CVD, although the dose may change over time. All patients with ACS are considered 'high risk'. Nitrates are potent vasodilators. In ACS, nitrates vasodilate the coronary vessels, improving oxygen supply to the heart and peripheral vessels, reducing BP and venous return and, thus, cardiac workload. Short-acting nitrates such as glyceryl trinitrate (GTN) sublingual tablets or spray are used for symptom control in acute stable angina or ACS. Long-acting nitrates (e.g., GTN patches or isosorbide mononitrate as slow release (SR) tablets) are used to prevent symptoms in stable angina. Long-acting nitrates have no proven mortality benefits, and their use should be reviewed in patients after percutaneous coronary intervention (PCI) or coronary artery bypass graft (CABG) surgery where ongoing angina is not expected. These patients should be instructed to seek help immediately if they experience chest pain or ACS-like symptoms. Morphine is used in STEMI, NSTEMI or unstable angina. This opioid is useful for both its analgesic and potential coronary vasodilating effects. Its vasodilating activity is thought to be secondary to decreasing pain and anxiety, which lowers circulating catecholamines and thereby reduces coronary vasoconstriction. Routine use of supplemental oxygen for acute chest pain is not recommended as there is insufficient evidence supporting its use and also some evidence to suggest potential harm. Supplemental oxygen may increase coronary vascular resistance, potentially leading to poorer outcomes compared to utilising room air. [#ogara-pt-kushner-fg-ascheim-dd-et-al.-2013] Oxygen therapy should only be instituted for hypoxaemic patients (SpO2 <93%) and those with evidence of shock, in order to correct tissue hypoxia. Oxygen should be used with caution in patients with chronic obstructive pulmonary disease (COPD) and carbon dioxide retention. The choice of pharmacological therapy varies depending on the type of heart failure (HF), and often changes as the condition progresses. The pharmacological treatment of left ventricular HF with reduced ejection fraction (HFREF) has an extensive evidence base and is well supported by clinical guidelines. While similar medicines are often used to treat HF with preserved left ventricular systolic function (diastolic HF), there is a lack of published evidence in this patient group, and management primarily focuses on treating the underlying causes. HF may solely involve the left ventricle or affect both the left and right ventricles (biventricular). Isolated right ventricular HF is commonly caused as a result of elevated pressure in the pulmonary artery, as in pulmonary artery hypertension (PAH) or lung disease. Note: Management of isolated right HF depends on the underlying cause, and is outside the scope of the HEART Online resource. The following HF treatment information is designed to complement existing resources by providing practical tools and support. For more detailed information on pharmacological therapies, please refer to the National Heart Foundation of Australia and the Cardiac Society of Australia and New Zealand guidelines 2011[#national-heart-foundation-of-australia-and-the-cardiac-society-of-2011] which reference major trials and provide management algorithms. HF results in neurohormonal activation, a compensatory mechanism that maintains cardiac output. As demonstrated in the figure below, this process is effective in the short term. However, in an attempt to maintain arterial pressure, the overactive system advances the deterioration in heart function. For further information see Pathophysiology of heart failure. Neurohormonal activation occurs through the sympathetic nervous system and the renin- angiotensin-aldosterone system. At this time, levels of noradrenaline, angiotensin II and aldosterone rise, resulting in chronic systemic and pulmonary vasoconstriction, cardiac hypertrophy and ischaemia, oedema and hyponatraemia. Medicines that prolong life and reduce morbidity are directed at altering the neurohormonal cycle described, and have a particular impact upon the renin-angiotensin system and the sympathetic nervous system. These systems are altered by the use of ACE inhibitors, ARBs, mineralocorticoid receptor antagonists (MRAs) and beta-blockers. These medicines are used first line in the treatment of systolic HFREF. Some medicines are used primarily to manage the symptoms of HF by manipulating haemodynamics. These include nitrates, (which cause vasodilation), diuretics, (which alter blood volume) and digoxin. ACE inhibitors act primarily on the renin-angiotensin-aldosterone system by blocking the enzyme known as ACE (angiotensin-converting enzyme). As illustrated in the figure below, ACE is required to convert angiotensin I to angiotensin II. By blocking the production of angiotensin II, ACE inhibitors are effective in reducing vasoconstriction, sodium retention, the release of aldosterone, and the remodelling of the heart. ARBs act on the renin-angiotensin-aldosterone system by directly blocking the binding of angiotensin II to the receptor. By blocking the effects of angiotensin II, ARBs reduce vasoconstriction, sodium reabsorption, aldosterone release and the remodelling of the heart. Spironolactone and eplerenone are MRAs that inhibit the hormone aldosterone. By blocking the effects of aldosterone, MRAs reduce fibrosis, hypertrophy and arrythmogenesis within the heart, as well as sodium reabsorption. Beta-blockers inhibit the adverse effects of chronic activation of the sympathetic nervous system on the myocardium. These adverse actions include ventricular hypertrophy and arrythmogenesis within the heart and may be mediated via beta1-receptors, beta2-receptors and/or alpha1-receptors. Preserved ejection fraction is seen in approximately 40% of all patients diagnosed with HF. Despite the incidence and prevalence of this type of HF, there is limited evidence to support pharmacotherapy. The approach is to aggressively manage the conditions that contribute to heart failure with preserved ejection fraction (HFPEF) development, which include hypertension, ischaemic heart disease and diabetes.